CrossFit Monolith | What Is CrossFit? CrossFit is a fitness regimen composed of real-life, functional movements, which are constantly varied and performed at high intensity. Why do we use functional movements? We have been performing functional movements since we learned how to crawl. 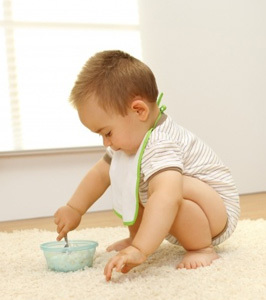 Pay close attention to a toddler bend down and grab a toy and you will see a perfect squat. This is how our body was designed to perform, in its natural state. We want to move as well in our sixties as we did in our childhood. We squat when we sit on a chair and we perform a dead lift every time we pick up a box from the floor. We run and jump when we play with our children. When we play a sport, such as tennis, or soccer, or a pick-up basketball game, we want to perform well while staying safe. Training with every day movements ensures that our body performs as it was designed to do. With CrossFit, we train for life. Why do we constantly vary our workouts? Our program prepares you to meet any challenge you face in your life. By not repeating the same workout and instead focusing on training real-life movements in a random format, you prepare for any activity, any sport, or any situation where you are required to utilize your fitness. It is also the only way to achieve results since it keeps your body from hitting the dreaded plateau that is common in most traditional fitness programs. Why do we train at high intensity? We believe that a strong will is the key to success. Learning to push yourself to your limits is the only way to develop the will power to surpass your own goals. High intensity workouts are the most efficient form of training since they develop the body’s three major energy systems and increase our metabolism, our endurance, and our lean muscle mass. High intensity workouts and the mindset they help us develop unleash the inner athlete in all of us. In our box, your body is the machine and your competition isn’t the person next to you on the treadmill. It’s you versus the clock. It’s you versus you. You have surpassed the gym fads, the uninteresting aerobics classes, and your own fight with the scale. In CrossFit, the fight is never lost. Every workout you complete is a victory, a step to a better you. As Socrates once said, “No man has the right to be an amateur in the matter of physical training. It is a shame for a man to grow old without seeing the beauty and strength of which his body is capable.” In our program there is never a dull moment. This is the place where you never shed enough sweat, where you give it your all and leave nothing behind but pure chalk residue. This is where you go unbroken and become a champion. Here, Nothing is Given. Everything is Earned. Join a community of people like yourself. People who seek to break down their own barriers. People who seek to become unbreakable. Together, we are an unstoppable and influential force.